As we enter into the peak season for beautiful fall foliage, don’t miss this narrow window of opportunity to take advantage of a stunning color backdrop for your holiday photo cards, courtesy of Mother Nature. The warm yellows, oranges, reds and browns of autumn, are eye-catching, flattering to faces, and available only for a limited time! A path through the woods, a pile of fallen leaves, or the textural interest of dried grasses and blooms in your garden make wonderful backgrounds for your Christmas card photo ideas. Whether it’s a shot of you with your dog, your significant other, or your family of five, the focus of the photo should be your smiling faces, but it’s fun to play with different angles and aperture settings to bring that colorful background into sharp focus (larger f-stop numbers) or to blur it (smaller f-stop numbers). Themomtographers.com has a great explanation of aperture settings if you want to experiment, but check your camera first. Many newer models have automatic settings that achieve the same results. What if you miss the boat and all the fall leaves are gone by the time you start thinking about Christmas card photo ideas? Don’t worry, there are plenty of fall activities that make great photo opportunities, such as the all-important pumpkin-choosing day, pumpkin carving, raking leaves, apple picking, hayrides—even Thanksgiving if you can wait that long! Since great photos are the key to fabulous photo Christmas cards, the more photos you take, and the sooner you start taking them, the better your selection will be. 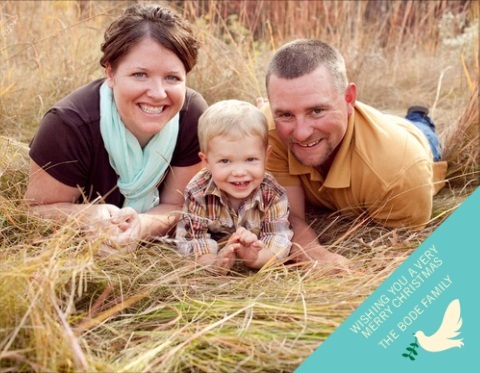 Once you have a photo you love, you’ll be ready to start creating your holiday photo cards. Still looking? Read more family photo ideas on our blog. The holidays will be here before you know it!